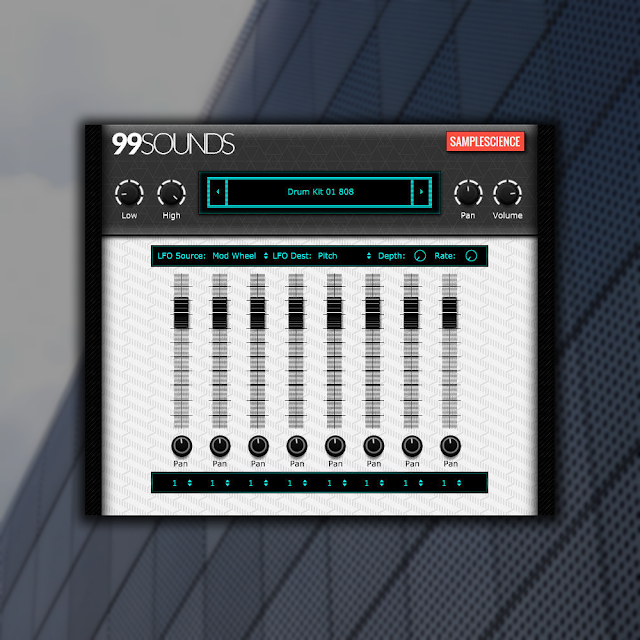 Drum Machine is a freeware drum rompler in VST/AU plugin formats for Windows and macOS, featuring the drum sounds from the free 99 Drum Samples sample library. The plugin features eight drum slots with support for stereo and multiple mono outputs. Each drum channel comes with volume and pan controls, along with global pan/volume controls and an LFO for pitch modulation. The Low and High knobs in the upper-right corner of the user interface control the MIDI velocity range. The drop-down menu is used for browsing through the available drum kits. This freeware instrument is compatible with all VST and AU plugin host applications on 32-bit and 64-bit versions of Windows and Mac OS.